Litecoin is a Windows finance and business application whose purpose is to help you store your Litecoins and transfer them out in order to be able to work with exchanges like BTC-e or send data to other users. In addition, this open-source tool allows you to encrypt and back up your wallet. You are welcomed by a clean and intuitive design that adopts a multi-tabbed layout. You are given quick access to several key features of the utility, such as Overview, Sending and Receiving parameters, Transaction, and Addresses. Litecoin reveals an overview offering details about the wallet (LTC values for balance and unconfirmed data), as well as recent transactions. In addition, you can view details about the number of active connections to the Litecoin network and info about the transaction history. The application gives you the possibility to send data to other users. You may manually enter the address to send the payment, import the address from the built-in address book, or paste the address from the clipboard. In addition, you are allowed to specify a label for the current address, provide the desired LTC amount, and enter multiple recipients. You may view a list with all your Litecoin addresses for receiving payments, copy the selected address to the clipboard, show QR code, sign messages, and export the information to CSV file format. 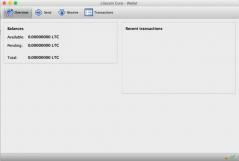 Litecoin reveals all your transactions along with information about each one, such as date, type, address and amount. The transactions can be saved to CSV file format. Plus, you may sort the listed information by date, receiver, sender and other criteria, and perform searches by address, label or minimum amount. When it comes to managing addresses, you may add new ones by providing information about the label and address, copy address to the clipboard, delete items, and verify messages. You can secure your wallet using custom passphrases, back up the wallet, run the utility at Windows startup, and set up proxy parameters. All things considered, Litecoin integrates a handy suite of features into an intuitive working environment in order to help you enable payment to other users and secure your wallet.